This post follows the precedent one (Japan IX). Please check it for explanations about how data is gathered and calculated. In this second part we show some additional storyline components. They deal mainly with the actors of the crisis, as portrayed by newspapers from the United States, United Kingdom, Australia and India. We will refer also the how media is giving media coverage to other implication of this disaster: about the nuclear debate, and about the economic consequences. First two figures refer to public institutions and personalities directly or indirectly affected by the Fukushima nuclear problem in terms of decisions, competencies or responsibilites. Main media reference is TEPCO, Tokyo Electric Power, the company that manages the troubled nuclear plant. It is the main reference in all countries. The company is scrutinized apparently by the media as the main responsible for managing the crisis and limiting the nuclear damages. In future posts we will show results about media reputation analysis about TEPCO. The following prominent public figures are the Japanese Government as an entity, the Prime Minister Naoto Kan and the Chief Cabinet Secretary Yukio Edano. They al share a very similar media exposure. Mr Kan prevails are reference for Australian media, while Yukio Edano is the reference for US and UK media. 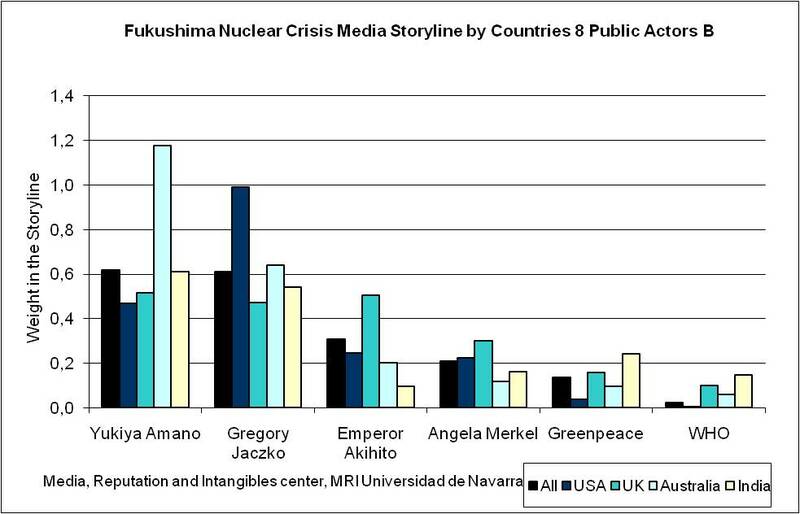 The International Atomic Energy Agency is the third actor in importance in terms of media impact in the Fukushima crisis storyline. For American media they play a minor role (1.5 points of media impact) in comparison with Mr. Edano (3.0 points). By contrast, Australia offers a wide coverage to IAEA, similar to weight given to local Japanese authorities. Also Indian media gives a major role than US and UK colleagues. At this point, US President Barack Obama plays a significative role in this crisis only for US media. Other actors with a relevent role according to media are presented in the following figure. Yukiya Amano, from Japan, is the current Director of the IAEA. His media coverage profile by countries is quite in line with that given to IAEA. The following person in importance by media coverage in relation to Fukushima is Gregory JaczKo. He is the chairman of the US Nuclear Regulatory Commission. His remarks in front of the US Congress depicting a somber evaluation of the Fukushima crisis has had not only a national impact in US media, but also in the other countries monitored. Emperor Akihito offered a public appearance and declaration about how “deeply worried” he was with the earthquake and tsunami disaster. His presence hs been portrayed mainly by British newspapers. At this moment (with news up to March 18), Greenpeace is playing a marginal role, as it captures merely 0.1-0.2 points of media impact by the media of our selected countries. World Health Organization is not being used as reference up to now. In the following figure we show some elements concerning how the Japanese nuclear crisis is opening the nuclear debate in each country. Remember that only Australia does not use nuclear power. We will probably show in the future a deeper analysis on this issue. 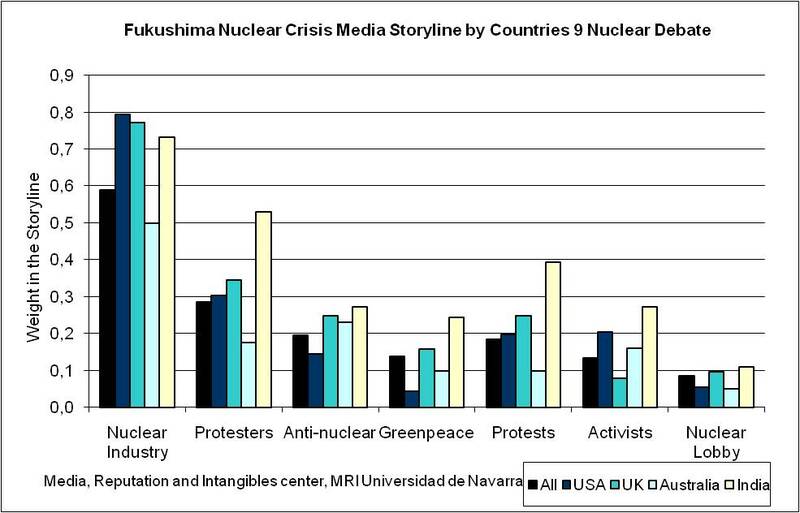 We find that Australia media refers less than the other countries to these issues, specially concerning nuclear industry, protesters, activists and nuclear lobby. Apparently at this point it is a more sensitive issue for media in India. There is ongoing media coverage about the nuclear industry in United States and United Kingdom. Next figure refers to storyline content directly related to business and the economy. It give some insights of the weight of economic considerations against the other ongoing issues, and suggest which economic issues are considered most relevant right now. 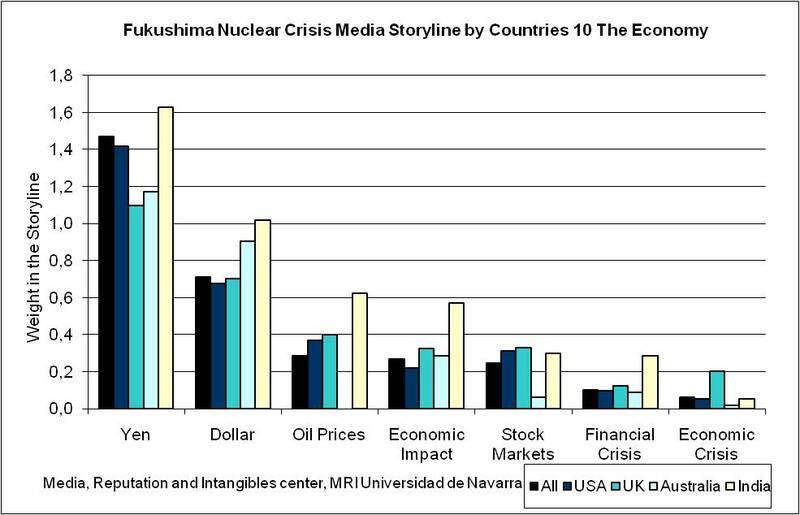 The impact of the nuclear crisis, and of the Tohohu tsunami on exchange rates between Yen and Dollar appear to be a leading issue in terms of media coverage. The impact on Yen valuation is highly covered by US media. Media from India is specially sensitive to the economic impact and the impact on oil prices. The concern about the impact of the Japanese disaster on the stock markets come as a second lin issue. According to our results, there is only a marginal mention in the media about possible impact in the financial crisis and economic crisis. This is currently not a major concern for media in all four countries monitored. Final figure considers other actors related to the crisis in a very direct and dramatic way in some cases, like the workers and the emergency workers, and others in an indirect way, like scientists and experts. Our approach allows to provide answers concerning the media coverage provided to each group in each country. 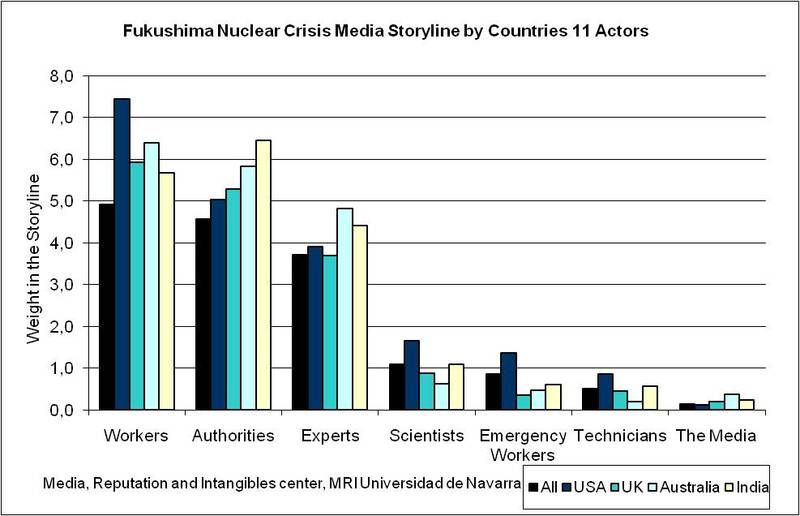 The role of workers in Fukushima nuclear crisis is the main reference group for media. Media from US insist more than others. This pattern is repeated when referring more specifically to emergency workers. The group of authorities comes second, are more favoured by media from Australia and India. The nuclear crisis is special in its media coverage as it requires explanations about technical issues to be understood by public opinion, and the severity of the events ask for innovative measures and solutions, and opens forecasts to unchartered ways. 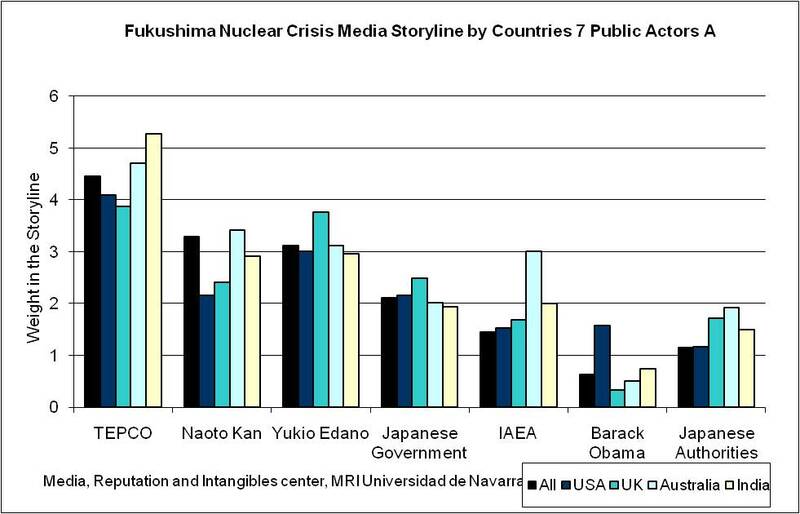 This is why specialists acquire a substantial role in the storyline of the Fukushima news coverage. According to our results, main media reference group is the so called “experts”, with a high media impact value of 4-5 points. They are specially used as source or reference by media from India and Australia. Then follows the group of scientists, with a media impact value around 1 point. They are most widely used by US media. Finally, the group of technicians take some 0.5 points of media impact, and again is US media the ones more focussing on theyr role and contribution.